Hecate IS the magickal power of the Word. She was worshipped in Ancient Egypt, the Black Sea, Africa, Greece. She is said to be the mother of the Heka, the Egyptian word for magic, and for those who perform magic. Heka was also the name for an ancient Egyptian god of magic and healing. She is all of this and more. She is the keeper of ancient knowledge. She is the sacred cauldron of secrets. She is the dark aspect of the Goddess, the Crone of the Maiden, Mother, Crone, the waning of the moon, when all is dark. 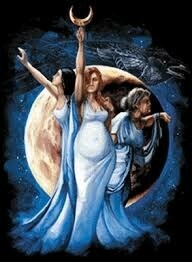 She is a fertility Goddess, her torch being carried over fallow fields to symbolize the moon’s fertilizing power. She is honored at the Crossroads, which She guards, holding her torch and accompanied by her faithful hounds. It is said that her hounds have three heads so that they are able to look in all directions. She, too, has the power to look in three directions, representing Past, Present and Future. Hecate was an ancient dark Goddess before the Olympian gods conquered and took power, She was the only Goddess that Zeus allowed to keep her authority and powers, one of which She shared with him, that of granting or denying what She wished for humanity. When the Catholic Church was rising to power, they (mostly) succeeded to put down the Goddess, whom they described as evil, ugly and a hag. (I say mostly, because She was never gone and was always there for those who knew and revered her.) When the church described the Goddess, it was Hecate of whom they spoke. 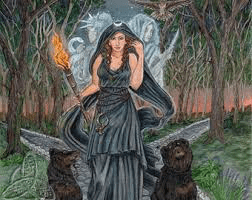 As such, Hecate stands for women in their fight against patriarchy; She helps women free themselves from the bonds of traditional, patriarchal religion, culture and society. She was/is also honored at “Hecate’s Suppers” where the Witches of Hecate share their magickal knowledge, leaving the leftovers outside for Her hounds. If you hear dogs howling at night, it means that She is near. She is celebrated on November 16th, which is the Night of Hecate. Hecate is the Goddess of death and the Underworld, as well as guidance and protection. Call upon her for protection when you believe someone is out to do you harm, to cease negativity against you and reverse the spell back to its’ owner. With her torch, she encourages us to make our way through obstacles and lights the way for our inner journey. As a Goddess of herbs and poisons, She is associated with belladonna, cyclamen, mint, garlic, wolfsbane, hemlock, and dandelion. 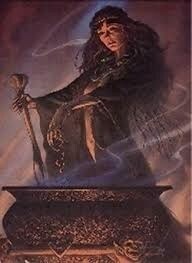 The tools most closely associated with Her are Her torch, the broom, and, of course, the cauldron. the blood of the dead run black.